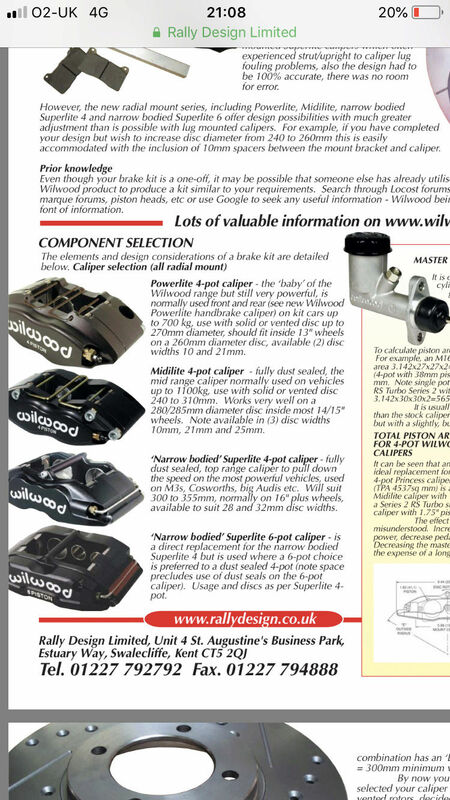 I'm looking for upgrade my front brakes, and so for you which is better for a 50/50 road/track use between the Akebono 2pots from Mitsubishi calipers with Clio RS discs and Wildwood 4pots Midilite 280mm brake kit ? I can't comment on the Wilwood setup as I've never tried it but, I have the Evo/Clio upgrade on my R for road use and its absolutely fine. I guess it depends a lot on how much abuse they'll get and the quality of parts used compared to the Wilwood setup. I've got fairly cheap 'predator' pads in mine along with 'Mtec' discs and for what I use it for they are alright. If I was to track it occasionally then I'd probably want more expensive pads though...then the prices start adding up! Mix that with carbotech pads and 278mm primera disc/bracket upgrade on rear and you got pretty decent package at low cost if take time source parts and it durable and easily serviceable. The floating 2 pots are nice calipers, easier on the discs and less issues with knock-off and steering judder . Only ones I prefer over that are the AP copies by k-sport but they overpriced in europe generally compared to asia . You taking about a sunny gti with a gtir lump .? I've ran 8 pot k-sport and they were batshit crazy. No fade and the same bit every single time hot or cold. It hurt your ribs. The wilwoods I've got on at the moment, untested but I can't see there being any issues, flex has been mentioned but I can't confirm. Everything about them means I have to spend less money changing discs and pads over the k-sports + I can run 17s instead of 18s as the k-sports were fricking huge. k-sport 6 pots are nice but not cheap in europe . K-Sport, Hi-Spec, PB, Ceika, etc, they're all made by the same MFG in taiwan, they just put their own logo on the caliper lol. For the Evo/Clio conversion I'm running 5mm spacers like in the link below. The rears bolt straight on no problem but the front ones I used my trusty Dremel to snip off the outer diameter, so the spacer would fit inside the disc properly. You kinda end up leaving something that resembles a snowflake. I think that's probably better than using washers (or similar) as at the very least the disc is fully supported and the thickness of the spacer is consistent. Been like that for a year and no problems so far! @Ryaneg6freak wrote: K-Sport, Hi-Spec, PB, Ceika, etc, they're all made by the same MFG in taiwan, they just put their own logo on the caliper lol. Some of them will be, is a few manufacturers in taiwan though, k-sport copied a lot of AP calipers, you can even use AP pistons and seals lol. K-sport pretty popular here and in malaysia with rally guys as decent design and price .